This page compares CPU vs DSP vs FPGA and describes difference between CPU,DSP and FPGA. The figure-1 depicts 8085 CPU architecture. The figure-2 depicts DSP architecture. 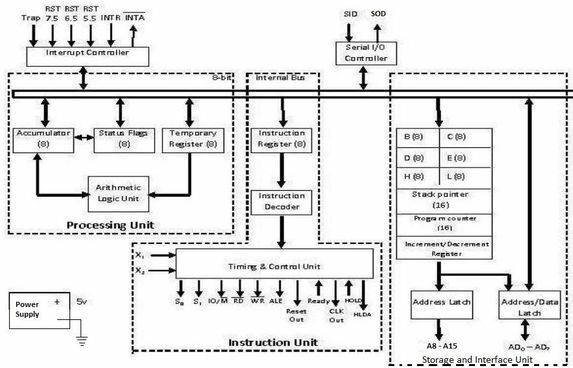 The figure-3 depicts FPGA Architecture. Following table-1 mentions difference between CPU and FPGA. Programmability Program execution Registers will determine modes and also defines operating parameters. Peripherals Equipped with peripherals with RS232, USB, Ethernet etc. Significant HW and SW effort is needed to implement these on FPGA chip. Following table-2 mentions difference between DSP and FPGA. Application as per sample rate Standalone DSP chips provide cost effective solution at few KHz of sample rate. FPGA is best suitable for sample rates are in few MHz. Data rate For low data rates extra cycles are available and hence DSP is not bandwidth limited. FPGA is easier and efficient to implement when I/O rates are greater than few Mbytes/sec. Data width/precision No limitation if data width is same as bus width of processor. Moreover there is no room for bit growth in the DSP algorithms. Suitable for high precision/high data width as it has uniform parallel structure. Implementation of decision trees or conditional branches. DSPs are ideal. FPGAs are not suitable. These tasks can be done with the use of embedded cores or microBlaze. Refer our Page on what a microcontroller does. Refer our Page on microcontroller programming using C language including example. Refer our Page on microcontroller development kit manufacturers.